A while ago I mentioned (here) that I'd love to try making a cloud mobile... and I have! Although a few people urged me to keep the peg version (their comments are all missing btw thanks to the massive blogger drama last week!)... I decided to keep it as it was meant to be. I love this... very dreamy and cute and rather appropriate to be making as the sound of rain can be heard outside my window. Perfect I suppose for a little baby's room... I'd love to keep it myself but can't quite convince hubby yet that it would go anywhere in our house... maybe in the car? yeah, I kinda prefer it without the pegs!! you can still make on for yourself...go on! Are you going to put it on your shop or should I make you an offer you can't refuse right here and now??? SO cute! defintely also going to add it to the 'to make' list. Oh yes, that would look lovely in the car! Or maybe hanging from the side of the tank/cage of whatever pet your husband is keeping at the moment! Seriously though, it is very gorgeous. 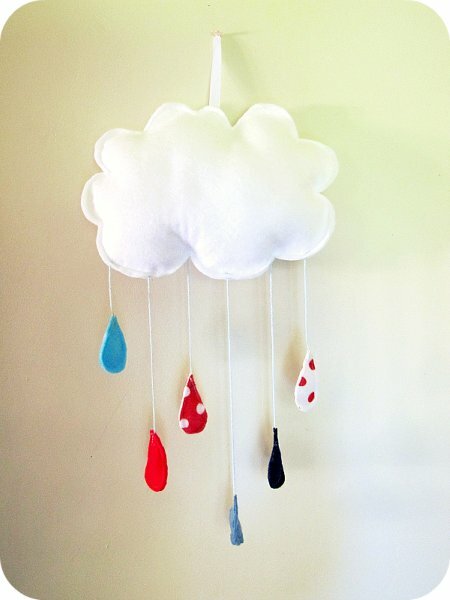 I love all the colours you have used for the raindrops. this is perfect! I love this cloud! I would like better in the car! Doesn't have to be in a baby's room - put it somewhere where you can see it and it will make you smile every time! Oh I like that. Its fantastic! 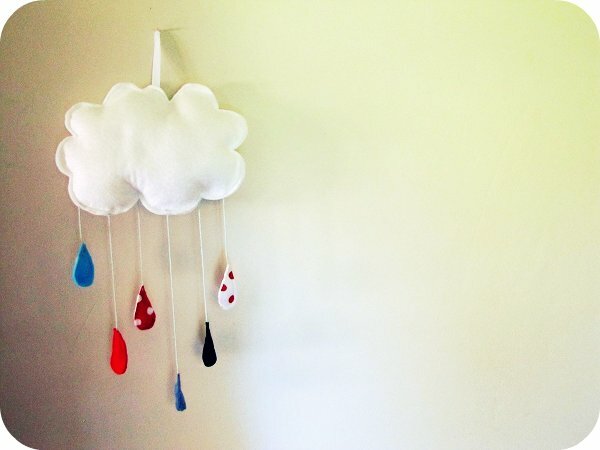 I have problems thinking of things to make for little boys rooms but that is perfect. Gorgeous idea! 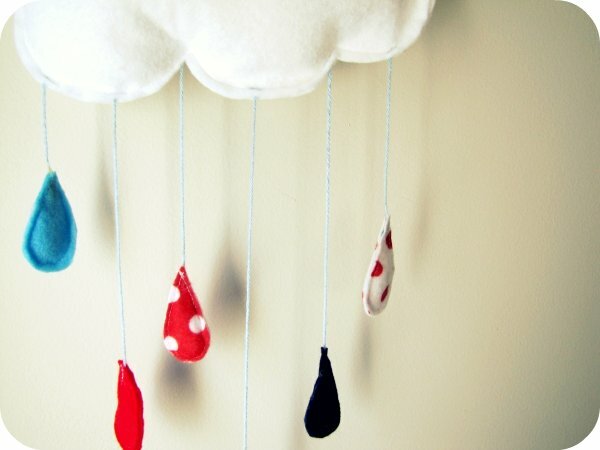 Defninitely would look good in the car - fluffy cloud instead of fluffy dice - you could start a new craze!! Oh please put it in the car & take a pic of your hubby again, just for a giggle!! It's gorgeous by the way! It's gorgeous and so very clever! Gorgeous! I wouldn't even mind if it even rained on me with raindrops looking that cute. That is super adorable. My little girl would love one in her room. wowow, i love this!!! i've been looking for ideas for my sons room and this is perfect! found you at 'our creative spaces', i'll add myself to your masses of followers! ha ha no it wouldn't get in the way at all in the car! Looks great. Kids room? I just put lanterns & pom pom's in our dining room - why not I say! I like, I like, I like! just joined your blog - so cute! Just found you...great blog...love that mobile...must be somewhere it will work in the house...got a skylight at all? It would sure sell though...groovy day!